The 1988 Democratic National Convention is host to the events of this sixth Wild Cards novel and politics is in the air. Ace in the Hole is the novel which has clearly been planned for several volumes now. Senator Gregg Hartmann is one of the leading candidates for the Democratic nomination. 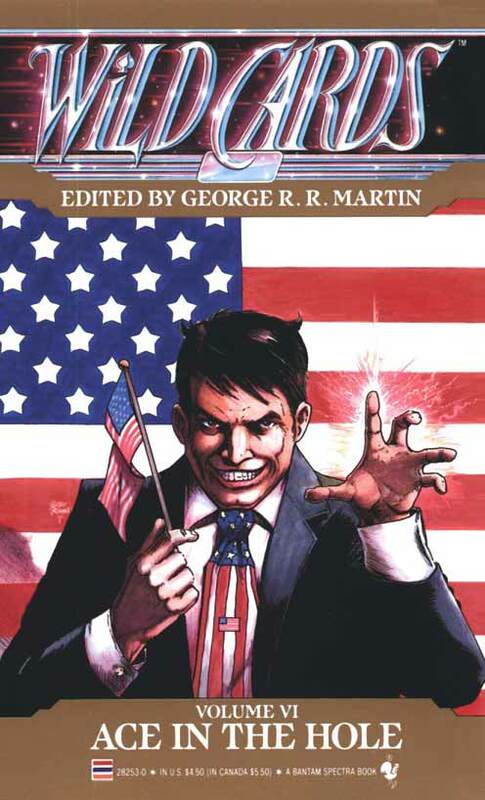 Readers of the first five volumes, and specifically the last two volumes, know Hartmann as Puppetman, a hidden ace with mind control powers and one which feeds on the fears of others. Puppetman is everything people have feared from aces, that one would take control of Washington and would be able to control the minds of others. Here’s the thing: despite the somewhat sinister nature of Puppetman, Hartmann himself has consistently come across as a man who could be a good President, one who could be good for America. Readers have had viewpoint chapters from Hartmann’s perspective in previous novels. Hartmann is the sympathetic ace with a potential dark side. On the other side of Hartmann is Reverend Leo Barnett, a fundamentalist Christian with a serious problem with those infected with the Wild Cards virus. Barnett seems to be the major “wild card” in this political race, not to pun too heavily on the series title. For those sympathetic to the jokers who actively suffer from the virus and to the aces who have been given great power (and great responsibility? ), Barnett is a seriously scary man and his ascendency to the Presidency would be a cause for mourning (and running). This is just the overarching political conflict of Ace in the Hole and while it is a major part of the novel, it is not the whole thing. Those who have read from the beginning will welcome the return of the Golden Boy Jack Braun, and there are various assassination plots unfolding – not to mention the very real threat of violence at the convention. Mixed in with the major story arcs with national implications, the smaller characters really shine here. The Golden Boy is one who does well with his page-time and his reflection on his history is quite poignant. Another is Demise, the man who can kill with a look. The continuing presence of Dr. Tachyon is less successful and his is a character who is beginning to wear out his welcome. In short, Ace in the Hole is a deeply tense novel filled with intrigue and danger. This is one of the strongest novels of the first six and it is likely due to the political thriller aspect to the novel. The entire first act is setting up the Chekovian “gun in the first goes off in the third” idea. At some point the tension is going to boil over and when it does, the reader really has no clue how things are going to go down and who will be left standing. There are a variety of ways Ace in the Hole could conclude, and each of them would lead to a number of story arcs that could play out in the subsequent volumes. There is a sense that anyone could die and that anything could happen, that this election could change everything. Written by Walton Simons, Victor Milan, Melinda Snodgrass, Stephen Leigh, and Walter Jon Williams, Ace in the Hole is a standout volume in the Wild Cards universe. By the end readers will be wondering how Martin and company could top that ending, and where Martin will take them next.